Poe can easily be described as a deep, dark, depressing writer, but many are unaware of his genius. He had emphatic believes about literature and how it should be composed. He felt poetry should be for poetry sake and never for moral lessons. And he adopted the practice of writing poems backwards. Many of his most famous poems had their last stanza composed first. 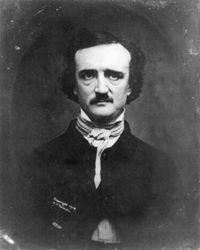 Poe also composed brilliant detective stories and was the inspiration of modern newspapers provided ciphered messages today. He began the practice in reverse, inviting anyone to provide him with an encoded message for him to decipher. A plublicity stunt that went a long way to win him prestige in his day. I share all this info, because Poe has always been a hero to me. His work struck a cord with me from an early age and in high school I was lucky enough to rescue an old volume of his life’s work from a local library before it was thrown out. It is still one of my most treasured books. The intelligence that shines through the darkness of his writing is truly is truly inspirational to me as a writer. I aspire to attain a small percentage of his ability to hook the reader into a story. And on an entertaining note I leave you with the Raven, as recited by Christopher Walken, a strange and yet appropriate pair. Not complete, but nice. You can find other full versions of this audio on youtube or buy the album from amazon. Wow very interesting and now I want to try it! I am now rather intimidated to post any of my poetry in light of you, but I think I will try out Poe’s idea, oh you forgot an r on one of your words, I thought you would want to know that: “…is truly inspirational to me as a write…” Anyway, keep on writing Jason you have a lovely gift!! Really like your poetry. I am also a writer, fiction and non-fiction, enjoy reading other writers who blog. I will be tuning in to see what you have added.